A week after tragedy struck Santa Fe High School, volunteers at College of the Mainland gathered to remember those lost their lives and show support for the Santa Fe school district. COMPeers, an organization made up of volunteers who routinely perform community service in the area, wore green and gold to work on Friday, May 25 and also took up a collection for the Santa Fe school district. Employees have been wearing green and gold ribbons as a show of support. 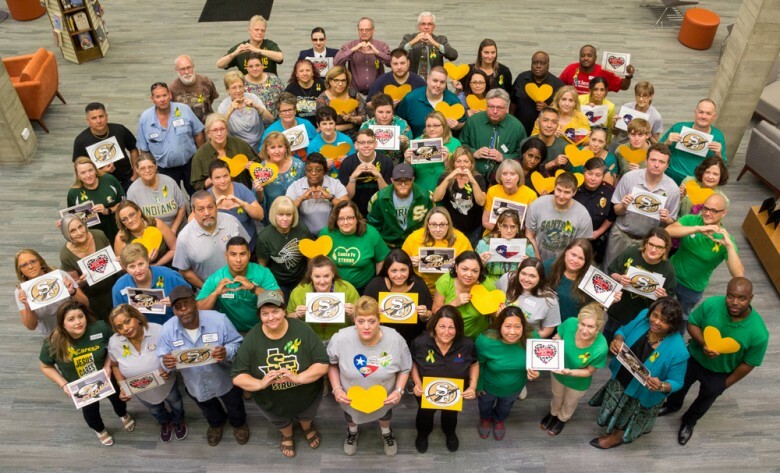 Employees at College of the Mainland extend their thoughts and prayers for the students, staff and families in Santa Fe during this trying time, especially to the families of those who died: Jared Black, Shana Fisher, Christian Riley Garcia, Aaron Kyle McLeod, Glenda Ann Perkins, Kim Vaughn, Angelique Ramirez, Sabika Sheikh, Christopher Stone and Cynthia Tisdale. COM employees are reminded that an Employee Assistance Program is available as a benefit for themselves and their families. The services, including short-term counseling, is free, convenient and confidential. To access this support, please contact the Employee Assistance Program at UT Employee Assistance Program: (713) 500-3327 or toll-free (800) 346-3549. You also can go to www.mylifevalues.com to learn more. The user name and password for the website is uteap.